PHOTO: The cast of Teen Mom 2 reunited in Los Angeles. (Courtesy of Instagram). 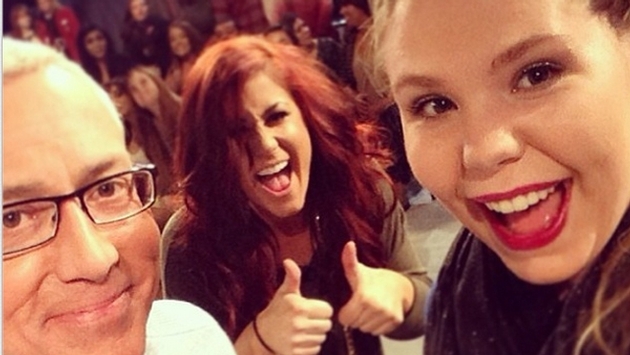 The "Teen Mom 2" cast was in Los Angeles over the weekend filming the reunion special for season 5. This is a bit of a change, because the cast usually travels to New York City to film reunion specials. This was the first one shot in LA. Lucky for us, Chelsea Houska, Kailyn Lowry, Leah Messer and Jenelle Evans (Javi, Jeremy, Nathan, Barbara, Randy, Dawn, and all the toddlers were there too) shared some photos via Twitter and Instagram, which kept us up to date on what went on during this trip. Unlike their recent venture to New York City, the cast appeared to stay on set most of the day. MTV built a new set and provided snacks and toys for the kids to play with during any downtime. Jace and Aubree reunited and Leah shared a video of her twins singing Miley Cyrus' "Wrecking Ball" (watch below). Causing the most controversy was Kailyn, who posted a photo of herself breastfeeding baby Lincoln. Fans were furious that Kail would post such a thing, but others took to her defense and said that it’s awesome that she’s normalizing breastfeeding. Given the fact that even the grandparents and baby daddies tagged along, this could definitely shape into a very dramatic reunion special.